In this tutorial, we will discuss techniques for planning, and flying, safely under IFR during the winter months. For the sake of discussion, it will be assumed we are flying a single-engine airplane not equipped for flight in icing conditions. We will also briefly cover tactics for escaping an unanticipated encounter with icing aloft. So, let’s get started taking the sweat out of aircraft icing! Read the entire article with full-sized pictures here. The first tenet of flying IFR safely in winter is to understand that there are limits on when and where we can fly. One of the most critical decisions for instrument pilots is the one concerning taking off into IMC in winter. There will be many days when it is just not prudent to fly. And recognizing when it is not a good day to fly should be based on a combination of sound judgement along with a mastery of weather analysis. The best way to illustrate how to make the go-no go decision is to use an actual flight that I planned while flying a Piper Saratoga. It was to be an instrument training flight in my friend’s Saratoga with a departure at 1930Z on a November 24, 2018, a typical winter day in the Northeast. Our planned route was from Skymanor Airport, N40, to Morristown, New Jersey, KMMU. Flight time to KMMU would be 26 minutes with an arrival at approximately 2000Z. The first step was to log onto ForeFlight and select the route and altitude to be flown. The preferred route was direct to the Stillwater VOR, then direct KMMU. The altitude we wanted to fly at was 5,000 feet. Now that we had the basics down, it was time to see if we could make this flight while staying ice free. I always have the VFR sectional chart up on my I-pad on an IFR flight. I do this for better situational awareness and to see ALL airports available for an engine out forced landing. 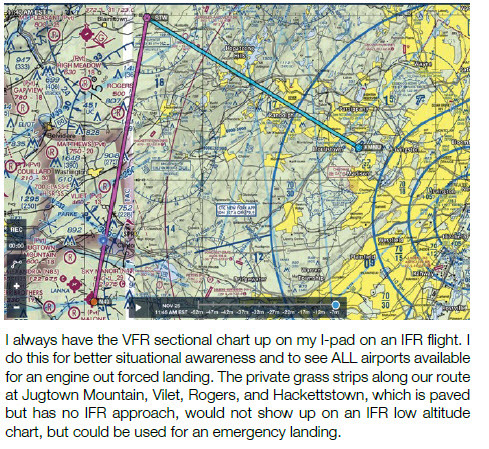 The private grass strips along our route at Jugtown Mountain, Vilet, Rogers, and Hackettstown, which is paved but has no IFR approach, would not show up on an IFR low altitude chart, but could be used for an emergency landing. The weather at N40, our departure airport, was a ceiling of 1500 overcast with a surface temperature of +3 degrees Centigrade. The METAR for KMMU showed the wind from 030 degrees at 3 knots, 1400 overcast and the most important number, the surface temperature, which was +1 Centigrade. A surface temperature of just one degree above freezing was a red flag that meant en route icing was a distinct possibility. To see if icing would be an issue, a check of the weather forecast was the next step. Naturally, we checked the METAR and TAF for our destination and alternate airports, with an eye for their surface temperatures. In addition, we looked at SIGMETS, AIRMETS, several icing probability charts, pilot reports for inflight icing, and most importantly, where the freezing level was. We found the freezing level to be at 6,000 feet for our planned flight. 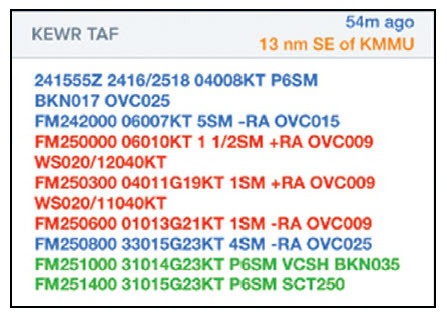 Here is the TAF for KMMU. But since KMMU does not have an official forecast, it is actually the TAF for Newark Liberty International Airport, 13 miles southeast of KMMU. Based on the TAF, an alternate was required, and we chose KEWR. This meant weather planning for destination and alternate would be the same. Our planned arrival time at KMMU was 2000Z on the 24th day of November, 2018. As can be seen, the forecast for our arrival time of 2000Z at KMMU was for wind 060 at 7 knots, 5 miles visibility in light rain and a ceiling of 1500 overcast. On the day of our flight to KMMU, there was a SIGMET for moderate icing from 6,000 feet and above. Since our planned cruise altitude was 5,000 feet, the SIGMET meant two things. No pilot may fly under IFR into known or forecast light or moderate icing conditions…unless the aircraft has functioning deicing or anti equipment….”. Keep in mind that a SIGMET is a forecast, and filing for a cruise altitude of 6000 feet or above would be technically illegal. The second consideration is that since a SIGMET, like all forecasts, could be wrong, more research was in order. The next step was to check the winds aloft and more importantly, the forecast temperature aloft at, above, and below our planned cruise altitude of 5,000 feet. We went on ForeFlight for this, and here is what we found. As can be seen, the temperature aloft at 5,000 feet would be +1 Centigrade, indicating we should be ice-free at our cruise altitude. 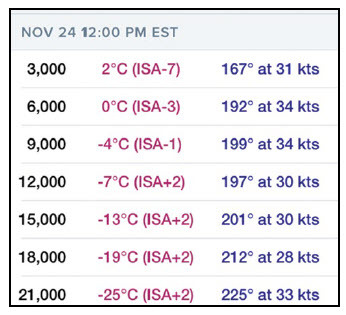 But the most important takeaway from this chart is the forecast temperature below our planned cruise altitude. It can be seen from the temperature aloft forecast, and the above freezing surface temperature at both N40 and KMMU, that the air below our planned cruise altitude and all the way to the surface would be above freezing. Having a warm air buffer below is one of the most important tenets of flying safely in the clouds in winter. Which Kind of Pilot In Command Are You? There are two kinds of pilots in command; those who play a game called “what if?” and those who play “I hope not.” It is the difference between flying proactively versus flying defensively. The “I hope not” pilot is betting that nothing goes wrong as he or she has no contingency plan if things go awry. The best pilots are those who play “what if?” These pilots ask themselves “what if something unexpected occurs?” and always have an “out” if it does. An example of having an “out” would be taking extra fuel in case the destination weather is unexpectedly below minimums upon arrival. It could also be extra altitude when flying over a large body of water so that if an engine fails, a glide ahead or behind will assure a forced landing on land versus a ditching. For the instrument pilot flying in IMC in winter, the most important “out” is having a buffer of above freezing air from the surface to at least a 3,000 feet AGL all along the route. If you have carefully planned the flight to avoid icing, but find the forecast was a bust and are flying an iced-up airplane, a descent into the safety net of the warm air below will be your salvation when the warm air melts the ice. Flying in IMC in winter when the freezing level goes all the way to the ground is not only flying without safety net, it is the very essence of flying defensively by playing the game of “I hope I don’t get ice.” If ice forms, where will you go to become ice-free? You will have to land with ice on the airframe and a much higher, but unknown, stall speed. Taking all of the weather forecasts into consideration, and the fact that we had the warm air buffer below, the decision was made to fly to Morristown that day with a reasonable assurance that it would be ice-free. Let’s say you are the ‘What if” kind of pilot, and the forecast for the flight to KMMU did not go as planned and icing conditions are encountered. The very first thing that should be done is to inform ATC without delay that you are picking up ice. The second thing is to request an immediate descent into the warm air buffer below, the one you proactively planned for as an out. However, if ice is accumulating rapidly, and an ATC clearance to descend is not forthcoming, declare an emergency and descend before the ice compromises your airplane’s ability to fly. In a declared emergency, the pilot is free to take any action necessary to save his or her airplane from disaster. This includes descending without a clearance, if that is the action required to mitigate a worsening situation. Remember, you can declare an emergency to prevent an emergency from happening. As the pilot in command, you are directly responsible for the safety of your flight. Never let ATC put your flight in danger. A climb in icing conditions should not be attempted unless it is certain you can escape the ice by climbing. However, prolonged climbs in excess of 1,000 feet in ice should be avoided. Climbing means increasing the angle of attack which will allow ice to form on the underside of the wing and behind the leading edge. This will dramatically increase drag, resulting in a loss of airspeed. With a load of ice, you might not get this airspeed back without descending. For more information on how to deal with inflight icing, refer to my article “Surviving the Unthinkable” in the February, 2017 issue. As always, it is my sincerest desire that the information provided in this tutorial will be of use to my esteemed readership. Please feel free to contact me for questions, comments, corrections, or to just yell at me via the email address below. In addition, I am available to all of my readers as a resource for any aviation related question.